If you are a regular user of BMTC, you would know that the commute during peak time is no picnic. One of my recent trips on a Sarjapura Road route at 5:30pm was no different. The bus driver and the conductor, were on an auto mode – shouting at the women – go inside, don’t crowd around the pillars, while driving / issuing tickets. This kamba bittu hogri (leave the pillar/support and go inside) is a refrain I’ve been hearing since I was a school student. So why do women crowd around the three kambas in the ‘ladies’ section? One glance and you realise majority of the women barely manage to reach the overhead bars / hangers for support. You cannot really balance on your toes for the entire journey, can you? Not with the way the driver ends up applying brakes, every few minutes. And if you are balancing a child or a large bag in one hand, the kambas are simply much more convenient. They also refuse to go inside, because then one is at risk of being groped, if you end up close to the ‘men’s’ section. Not many women may admit but this is practically an everyday story. Irrespective of the woman’s age or clothing. Talking of large bags, if you are traveling the towards KR Market, Shivaji Nagar or Majestic in the early mornings or early evenings, you will see both men and women with large bags and baskets. These are construction workers, flower or vegetable vendors carrying their wares and tools. They along with school children with their large school bags are considered a nuisance by both BMTC staff and other commuters. But no one has thought of creating a space in the buses for them to keep their baggages. So far only the air travellers using Vayu Vajra, have that privilege. Yes, agree that these ‘tin boxes’ as they are infamously referred to, barely have enough space to accommodate commuters, but why isn’t this thought of? Another design ‘idea’ that irks me to no end is some of the seats that face each other. This again is in the women’s section. It makes most women uncomfortable, because they end up facing the men at the back. Considering, BMTC is a fertile ground for harassment, their discomfort is completely justified. Most women end up turning sideways staring out of the window or at the crowd inside the bus, the whole commute. Women, who can afford to, tend to use the air conditioned buses because ‘they are brighter, more spacious and there is lesser harassment.’ But this is an expensive affair and not every woman can afford it. Many of the tin boxes also don’t have low floors or steps to get into the bus, making it difficult for mothers with children, pregnant women and older women and men to climb in ‘quickly.’ And if you are disabled, you cannot negotiate these buses without help. Some of the newer buses and all the air conditioned ones, do have low floors and the ease is obvious. You are enthusiastic to plant trees in your neighbourhood, but don’t know how to do it. This is your how-to-do guide. Street dogs is a topic of major controversy. There are people who argue they ought to be culled and people who are against it, but have no idea on how to fix the problem. This youngster, says she’s found a solution to this problem. Some of them wanted to grow a green thumb. Some wanted their green thumb to go organic. Both had a glimpse of what goes into terrace gardening without chemicals. I have also seen it on some new buses in Shillong. (JNURM funded). @Budhi – this is an interesting observation. Whether this feature was include in the specifications for supply of Volvo and order placed? If BMTC/KSRTC authorities are online with Citizen Matters, they must respond or else CM can forward this and other observations to BMTC/KSRTC for their online remarks/comments. Courtesy demands that they answer. HOW ABOUT A STOP BUTTON near every seat/pole/door/window?? Why was this feature left off? I have seen it on Volvo buses in other countries. Who pocketed the money saved? 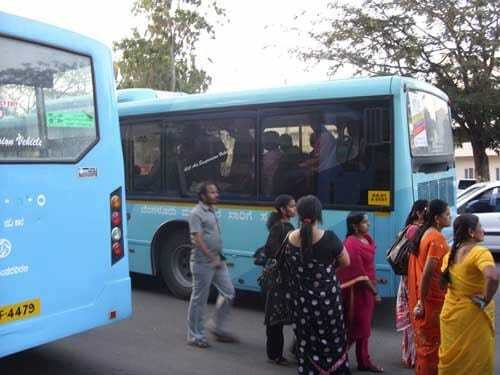 (1) Women being subjected to harassement in jampacked buses can be avoided by bifurcating the BMTC buses with steel barricade/partition near the middle-entrance so that they can get in and get out from the front door. Partition should be of minute grill work with a small door – only for the conductor to move for issue of tickets. No entry for men. (2) In trains and mofussil buses, we see thousands of people travelling standing for hours together. In cities, the duration of commuting is relatively short and we commute with the sole purpose of reaching some place and getting back on time. So, let us have buses without seats that occupy majority of space to be used by a minority of people. We can have more buses with standing facility with enough hangers that are sturdy and are aplenty. A few seats may be provided only for senior citizens / disabled people. This way, more people may travel in one bus, more revenue to BMTC and if e.ticketing / smart card facility is introduced,it may help commuting faster. I agree, there’s a lot they can do about the design, especially for the physically challenged. Even little things like enforcing reservations for the elderly, women etc are not that strict. I even had fights with a conductor over a really elderly person, close to 80 standing on trembling legs and no one getting up for him while the reserved seats were being used by younger folks. For men, it’s a whole different problem, especially when traveling in Volvos during non-peak hours. Buses don’t stop if your stop is not a ‘major’ one, no one is getting down and if there are no women to get in. Sometimes, buses stop at non-bus stops near S/w campus gates if there are women standing. I even ask some woman waiting for something else to hang on for a few seconds more so that the bus would stop and I could get in. Bus services are a lot more friendly than some 10 years back, but they are no where close to perfect and there’s a LOT of room for improvement still. Good article. A lot more needs to be written about the travails of bus users. the overhead bars are unreachbale for a lot of women and children too.These buses have been designed without much thought it looks like.